Truly a gifted actor, Tony Leung Chiu-Wai is almost too good to be working in the action genre, where most leading actors can't even act. Although he is sometimes wasted in dumbass Hong Kong films like Aces Go Places 97, he has proved his acting creditibility in Wong Kar Wai's masterpieces like Happy Together and Chungking Express.Like many Hong Kong actors of his generation, Tony Leung is an alumnus of the prestigious TVB Actors Training School. During his years in the television network, Tony Leung manage to craved a name for himself by starring in notable TV series like Police Cadet. After completing his contract with TVB network, Tony made the move to the big screen but unlike other fellow TVB actors-turned- movie actors, Tony's transaction to the big screen was a relatively smooth one. 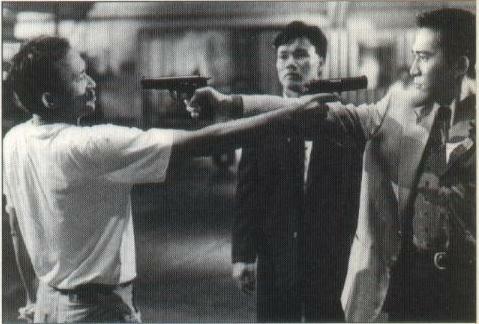 After starring in Wong Kar Wai's Days Of Being Wild alongside Canto-pop star Andy Lau, Tony's breakthrough preformance came with John Woo's apocalytic Vietnam epic Bullet In The Head. Tony Leung has since proved himself a remarkably versatile performer, able to hold his own equally as a tough cop opposite Chow Yun Fat in Woo's Hard Boiled and in a purely comic role alongside Jacky Cheung in Ko Shou Liang's Wong Kar Wai parody Days Of Being Dumb. Often confused with the other Tong Leung with whom he appeared alongside in the 1993 hot comedy He Ain't Heavy,He's My Father, he continues to be a prolific player on the Hong Kong scene.Most recently, Tony Leung won Best Actor honors at the 2000 Cannes Film Festival for his performance in Wong Kar Wai's In The Mood For Love.